In terms of sheer prowess and track competence, the new, 2016 Ford Shelby GT350 and GT350R Mustang models have just one true pony car competitor: the 2015 Chevrolet Camaro Z/28. Sure, the Dodge SRT Hellcat Charger and Challenger each put out gobs of horsepower, as does the Camaro ZL1, but each is more straight-line dominator than sharp corner-carver. The folks at Motor Trend recently got their hands on a Shelby GT350, a GT350R, and a Camaro Z/28, setting each on a dynamometer for a series of runs to see how the Mustang’s marvellous, 5.2-liter “Voodoo” V8 measures up to the mammoth, 7.0-liter LS7 powering the Chevy. The chart above shows the results of the three cars’ respective dyno runs. Note that, interestingly, despite the Shelby GT350’s higher claimed peak horsepower (526 HP at the crank), the Camaro Z/28 actually achieved a higher rear-wheel horsepower. 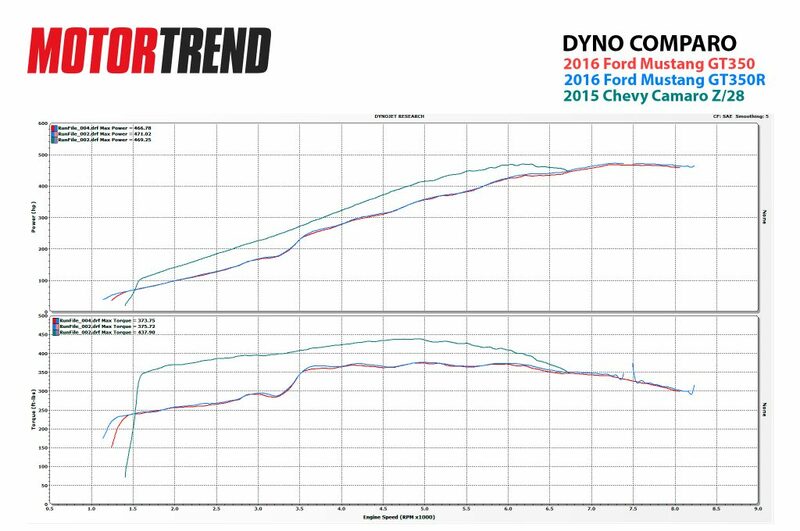 The Motor Trend staff speculates that either this is due to the relatively high ambient air temperature (around 100o Fahrenheit) having a greater affect on the higher-revving Voodoo V8, or possibly due to lower driveline losses in the Camaro. The other point of interest comes at around 1,500 RPM, at which speed the (relatively) small Shelby GT350 motor is producing just 239 lb-ft of torque, to the Z/28’s 341. That’s to be expected, as larger-displacement engines tend to produce more torque at the majority of engine speeds. Of course, the gap narrows as engine speed increases, and the superior breathing efficiency of the Shelby GT350 comes into play. What does all this mean? Well, the Z/28 produces a more satisfactory amount of torque at “normal” engine speeds, and at least tentatively, it seems as though the manufacturer’s claim of 505 peak horsepower at the crank is a tad conservative. That said, while there is no replacement for displacement, the Voodoo V8 in the 2016 Ford Shelby GT350 and GT350R does a stunning job with RPM range and revability. Remember: the flat-plane crankshaft, hollow intake valves, sodium-filled exhaust, and other lighter-weight internal engine components mean that while the Shelby GT350 might not produce as much grunt at low engine speeds, it can reach the far reaches of the range much more quickly. After all, that’s where the magic happens.